Russia simulated a ‘large-scale military attack against Nato’ in its war games in September, the commander of the Estonian Defence Forces has claimed. A massive programme of war games featuring tens of thousands of troops and codenamed ‘Zapad’ took place near the Belarus capital Minsk in September. The war games, which occur every four years, showed off Russia’s ability to build up its troops with very little notice in case of conflict, Terras said. At the time of the simulation, there were fears Moscow was using the training as a cover to station soldiers and equipment in the country. The simulations included artillery, tanks, rocket launches and simulated air and navy raids, were a dry-run for a ‘shock campaign’ against Western European NATO members – including Germany and the Netherlands. Drills also rehearsed the capture of the Baltic states – Estonia, Latvia and Lithuania- as well as Poland, Norway and the non-aligned states of Sweden and Finland, analysts said at the time. 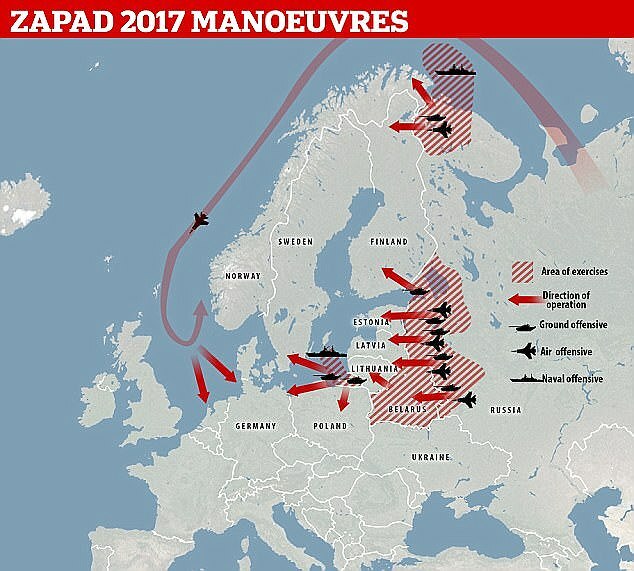 Gen Terras told German newspaper Bild of the drills: ‘Let me be clear: with the exercise Zapad 2017, Russia simulated a large-scale military attack against Nato. ‘It was not targeted towards the Baltic states only, as it was a theatre-wide series of exercises spanning from high North to the Black Sea. Russia’s neighbours claimed at the time that the Kremlin was using the exercises as a rehearsal for an occupation of a number of adjacent nations that were under Moscow’s rule before the Communist Soviet Union broke up in 1991. Two analysts previously told Bild that the drills were simulations against Nato during interviews in December. The unnamed experts said the drills imagined the invasion of the Sulwalki Gap, a small area of NATO land that links Belarus with the Russian enclave of Kaliningrad. A mock state on a similar stretch of land was created during Zapad and named ‘Veyshnoria’ before it was ‘invaded’ as part of the war games. The experts also claimed Russia practised ‘neutralising or taking under control airfields and harbours (in eastern Europe), so there are no reinforcements arriving from other NATO states there’. pic Russian jets cap: Drills also rehearsed the capture of the Baltic states – Estonia, Latvia and Lithuania- as well as Poland, Norway and the non-aligned states of Sweden and Finland, analysts said at the time. The analysts also said that the country’s air force flew through the North Sea and past Germany and the Netherlands for two days to rehearse taking out the likes of airports, power reactors and naval bases. ‘They exercised bombings of Western European targets, approaching the German and Dutch coast from the North Sea as well as Swedish, Finish and Polish mainland from the Baltic Sea,’ the sources said. Targets in a real-life situation would include ‘critical infrastructure, that is, airfields, harbours, energy supplies and so on, in order to shock the countries and make the populations demand from their governments that ‘we shouldn’t be involved here, we should go for peace instead’. Training manoeuvres over the North Sea may have been designed to show Russia has plans for ‘show of force attacks’ deep in Western airspace, the sources said. They also suggested missile defence systems were better prepared in Eastern European NATO states compared to the likes of Britain, Germany and Denmark. The war games also involved anti-submarine warfare and air defence drills throughout the Baltic Sea, it is claimed. This was to practice weakening NATO in the event of an invasion of Latvia, Estonia and Lithuania. 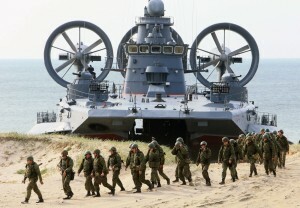 There were also anti-aircraft, anti-ship and even anti-combat diver drills in the area, the sources said. Attacks on Sweden and Finland were also rehearsed in September because Russia ‘would not expect them to remain neutral’ in the event of a real war, the experts suggested. Some of the thousands of troops deployed during the exercise are said to have been sent to the Kola peninsula, which borders Norway and Finland. 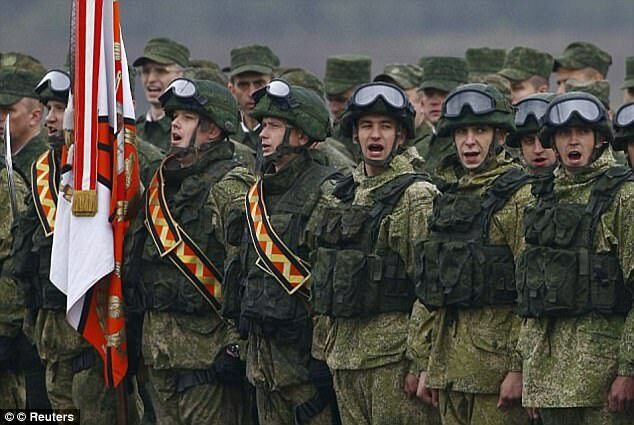 One of the sources said Russia may have plans in place to ‘neutralise assets’ in the region. Another exercise reportedly saw two waves of Tu-95 and Tu-22m3 bombers as well as 50 warships practising raids on Norway’s Svalbard archipelago between Russia and the Arctic Ocean. 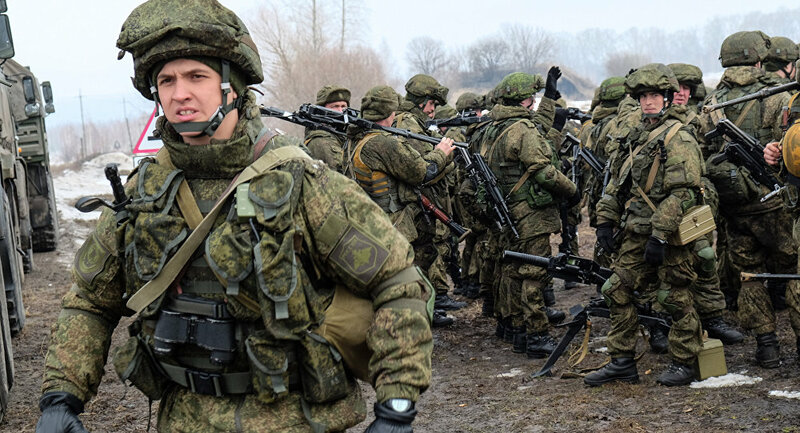 Up to 12,700 troops took part in the drills in Belarus while a further 12,000 were involved in training in Leningrad and Pskov regions – close to the border with Estonia, – and 10,000 more were sent to the Kola peninsula, the sources said. But taking into account navy and air force personnel and National Guard troops, more than 120,000 were involved, they added.